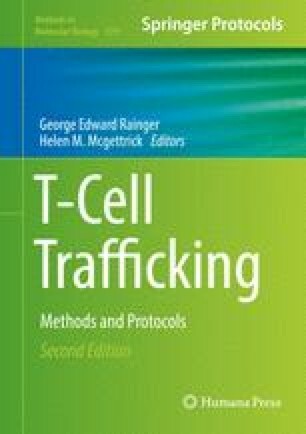 Advanced cellular tracking and imaging techniques allow the dynamic nature of immune responses to be studied in detail and in a physiological context. Here we describe two methods applying multiphoton laser scanning microscopy to the visualization and tracking of fluorescently labeled CD4+ T cells and dendritic cells (DCs) within the complex lymph node (LN) environment. Ex vivo imaging of LNs allows the study of cell populations without the need for skilled surgical techniques while providing comparable data. While more technically demanding, intravital imaging of the popliteal LN allows aspects of T cell/DC responses to be studied in the context of an intact lymph and blood supply. We also describe methods to aid the acquisition of time series data suitable for cellular tracking, providing a quantitative approach to real-time analysis of DC and T cell LN responses. The authors acknowledge Arthritis Research UK (ARUK) for funding their research in conjunction with the ARUK Rheumatoid Arthritis Pathogenesis Centre of Excellence—RACE—part-funded by Arthritis Research UK through grant number 20298. The Centre is a collaboration between the Universities of Glasgow, Newcastle, and Birmingham. This work was also supported by the IMI JU-funded project BTCure 115142-2.